Steps: Learn the Word - Verse #15 and June's Winner! Learn the Word - Verse #15 and June's Winner! Melissa Tagg, it's all you:) Grab something from the gift bag at the right there and email me what your prize pick is. For the rest of you, keep pinning and memorizing. I truly wish I could give out monthly awards to all of you--just like in Sunday School:) But know, I pray for each of you that God's Word would embed in your heart. Imperfect progress, that's what we're going for as we remember that His Word never returns void. So keep at it. He is faithful. All right, verse 15. It's our second week on this one and here it is! So this verse is to help us remember God's name of El Roi - The God Who Sees Me. I just love that, don't you? On so, so many levels. ~We are not invisible to God. We matter to Him. ~We are never out of His sight. We are protected by Him. ~We are never lost. We are found in Him. ~We don't need to pretend. He knows every part of us. And before that last one wigs you out--because if He sees it all...well, then, He sees it all--remember His living, breathing Word says that even though He knew we were sinners, He still died for us. Crazy, right? But I like God's kind of crazy. He has this inexplicable, all-encompassing, blow-your-mind, kind of love aimed right at you and me. Pretty awesome. And it's because of that love that He constantly keeps us in His sight. 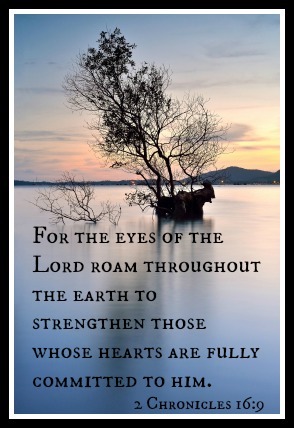 His gaze roams the earth, seeking us, watching for what we need so He can strengthen us. There will never be a situation--never--in your life where you are unseen or alone. Because El Roi - The God Who Sees Me - will always be there. And oh man, I love how you unpacked that verse. It's tempting to me to just focus on the part about "whose hearts are fully committed to him." Which, hey, isn't a bad thing to focus on. I want to be fully committed to him! But that first part of the verse...knowing God sees me, that's huge. We're never lost or invisible to him. So when that "fully committed" part feels a little difficult or heavy, remembering that first part eases some of the load...just taking joy in the fact that he sees me makes me want to be even more committed!